Harper Voyager Impulse, 9780062659118, 448pp. Quinn Bradley has learned to use the magic of another world. And that world is in danger. Having decided to betray CASE Global, he can finally reveal his origins to the Enclave and warn them about the company’s imminent invasion. Even if it means alienating Jillaine…and allying with someone he’s always considered his adversary. As Quinn searches for a way to turn the tide, his former CASE Global squad-mates face difficult decisions of their own. For some, it’s a matter of what they’re willing to do to get home. For others, it’s deciding whether they want to go home at all. 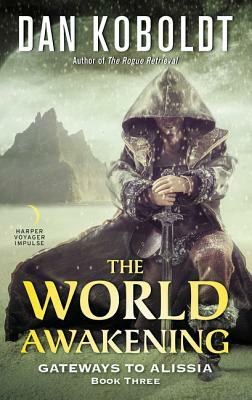 Continuing the exciting adventures from The Rogue Retrieval and The Island Deception, The World Awakening is the spellbinding conclusion to the Gateways to Alissia fantasy series from Dan Koboldt. Dan Koboldt is a genetics researcher and fantasy/science fiction author. He has co-authored more than 60 publications in Nature, Human Mutation, Genome Research, The New England Journal of Medicine, Cell, and other scientific journals. Dan is also an avid hunter and outdoorsman. He lives with his wife and children in St. Louis, where the deer take their revenge by eating the flowers in his backyard. The Rogue Retrieval is his first novel.